Best Port we stopped in! We arrived in Dubrovnik as one of our last ports for the cruise. It was absolutely amazing! We traveled to the Old Town using their city bus which was crowded but very inexpensive. We walked into this beautiful city and were floored. The city walls are high up against the clear blue ocean! To walk on top of the walls cost 10 Euros. Even if you don't do this, the town itself is a must see. There were men playing classical music, aromas in the area, the historical castle you are walking through, and some of the friendliest people you can meet. This was truly a great experience. We only stayed half the day because of the cruise but I would go again! Bring a camera because you don't want to forget this trip! Great! Apart from when it's raining where it becomes a pool!!! I was in Dubrovnik for one day and boy am I glad that I got a chance to see the Old City. While I entered it at around 6pm, it still gave me enough time to meander through its tight alleyways, climb the city walls, and grab a drink at Buza, the famous bar that overlooks the sea. 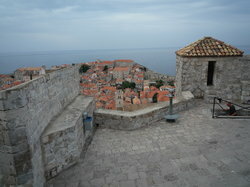 If you don't already know, the Old Town is walled city built on a promontory that sticks out into the Adriatic. Can't get much more scenic than that. While a walk around the city walls are a must (to take it all in), don't rule out just exploring the town, sitting down at a restaurant, and striking up a conversation with some of the people who still live there today. While certainly an Old City, there are restaurants and shops galore as well as some pretty scenic bars (don't miss Buza). My only regret is that I didn't go to the city earlier and have some more time to spend. It's easily and afternoon+evening destination. We went to Dubrovnik on a day trip from Brela, and we were so glad we did. It was a 3 hour coach journey but it was well worth it. The architecture is fantastic and there is so much history there. We took a guided tour of the old town which was very informative and included a museum tour. There are great shopping opportunities and some fantastic little cafes. We didn't walk around the wall as it was over 36 degrees on the day we went and we were told there wasn't many opportunities to get a drink or get down if we were too hot. 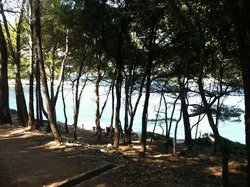 Overall, we really enjoyed our day in Dubrovnik and would highly recommend it to others. Mini-Venice , but without the canals. 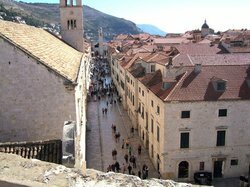 Dubrovnik often calls itself the 'Pearl of the Adriatic' and the Old Town certainly shows its Venetian heritage. Encircled by massive defensive walls and free of traffic, its streets are polished smooth by centuries of use. Renaissance churches, monasteries and palaces testify to the importance and wealth of this historic independent, trading port. Outside the Old city are examples of Austro-Hungarian villas and some very large hotels built during the 60s/70s international tourist boom. 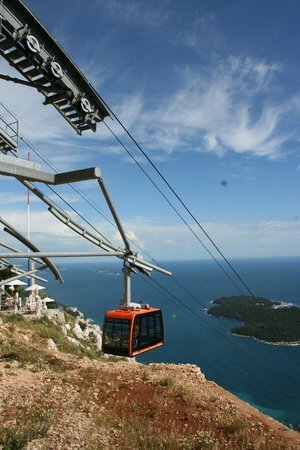 As Croatia's most popular tourist destination and also a regular stop-off for cruise ships, prices are more than is the norm for the region (sea food being particularly expensive), so shop around. Wandering away from the obvious 'tourist traps' can be interesting and also may help you find better price deals. 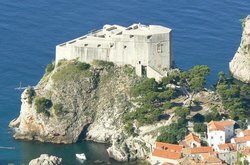 There are some small 'town beaches' just outside the Old city walls and good excursions can be booked to nearby islands like Lapad, some of which are still almost unpopulated (as usual look at prices quoted by tour boats by the harbour/local travel agents rather than package tourism reps). Dubrovnik is one of my favourite places. I have been there at least 6 times over the years and hope to visit again one day. Enjoy!